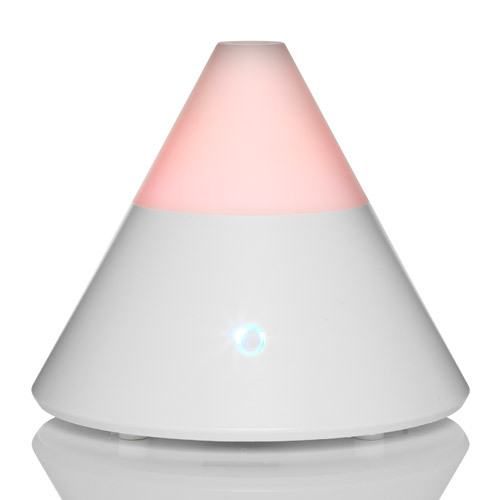 The Zenbow Ultrasonic Aroma Diffuser with Colour Changing Mood Lighting can be used with light off mode. This pyramid of light and fragrance soothes the mind, body and spirit. The Zenbow benefits from colour changing mood lighting which easily moves through a rainbow of colours whilst emitting a cool, scented and relaxing mist to create a ‘Zen’ like atmosphere for any space – hence the name Zenbow. The Zenbow also has the option of setting to a favourite colour or using without the light. 1. Remove the diffusion cone. 2. Fill the water tank with clean water (Maximum 80ml). 3. Add 3-5 drops of your favourite essential oil into the water. 4. Replace the diffusion cone. 5. Plug the adaptor into the mains and press the on/off button. Below are reviews of madebyzen Zenbow Ultrasonic Aroma Diffuser by bodykind customers. If you have tried this product we'd love to hear what you think so please leave a review. Really pleased with this product. It has a great range and looks unobtrusive which makes it perfect for my lounge. Great diffuser, bought one for a friend after being thrilled with mine. Great price too. The Zenbow Ultrasonic Aroma Diffuser with Colour Changing Mood Lighting can be used with light off mode. This pyramid of light and fragrance soothes the mind, body and spirit.